And the best new Holiday side dish award goes to my daughter in law, Ericka When Ericka brings something, pay attention. The girl has taste. Hey, she married my son! This quinoa and sweet potato dish is perfectly spiced and tastes even better the next day. Only problem is this dish is not that photogenic – but OH SO Good! Rinse quinoa well, drain. Put rinsed quinoa in medium saucepan over medium heat and still till quinoa is dry. Then add 1/1/2 c veggies broth, 3/4 c water, and 1/2 t salt. Bring to a simmer, cover till quinoa is cooked and fluid is gone (about 15 minutes.) In the meantime, heat EVOO in a large skillet over medium heat. Add the onion and garlic and cook till slightly softened. Add the chile powder , coriander and cumin and cook till spices darken (about a minute). Add the rest of the veggie broth , the jalapeno, the sweet potatoes and 1/2 t salt. Increase the heat to medium high and bring to a simmer. Cook stirring occasionaly until the sweet potato is tender and the liquid is reduced (about 15 minutes too.) 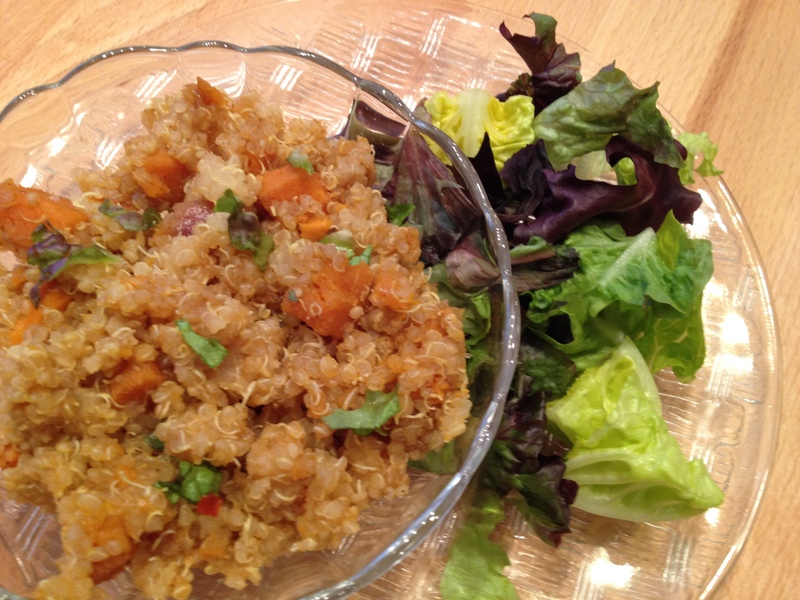 Add the sweet potato mixture to the quinoa, then add the cilantro and lime juice and season with salt to taste. Oooh that looks really yummy!